Hosting a party for whatever occasion presents many challenges. Of course there’s the food and we have already covered that side, then there’s the…what does everyone eat off of problem? 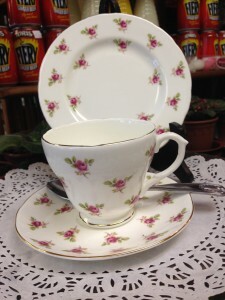 Whether you are hosting a simple tea party, a garden party, a shower, an office party, an open house or a wedding, the odds are you will not have enough cups, saucers, plates, glasses, the right kind of linens, chairs and tables. 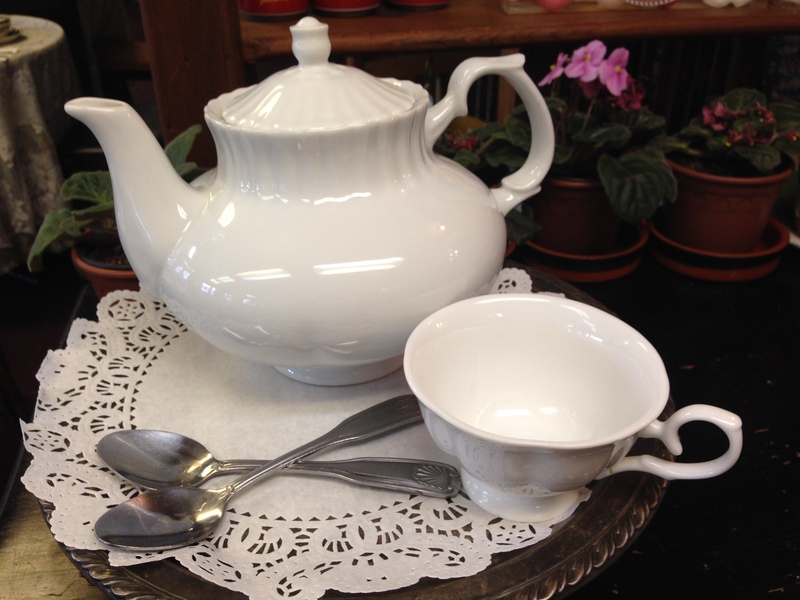 We know you will not have silver ware, silver tea pots, tea strainers and even teacarts….WE DO! We are proud to announce that you can now rent these items at very reasonable rates from Sally Lunn’s Rentals. If there is any item that we do not have we will try to find it for you. Below is a list of items available for rent, all you have to have is a credit card and the date and your set to host an elegant affair, using fine English bone china, not the clumsy, chunky and very unattractive items that are currently available from the party rental people. JUST TEA POTS. We have a good selection of interesting tea pots for hire, prices start at $4.50. 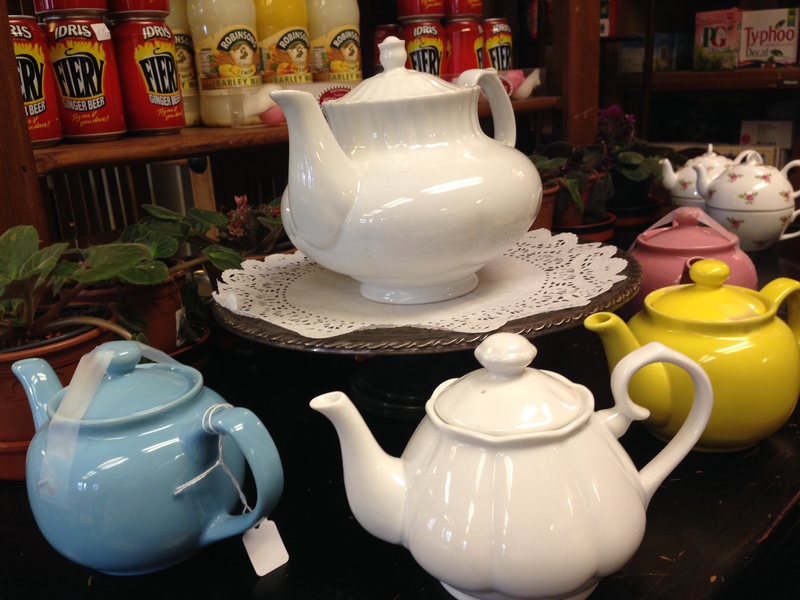 This is a 4 cup teapot, it’s very elegant and will match most colour schemes and settings. If you just want to hire a teapot that will match most patterns this will be the one. Matching fine English bone china tea plate $.95/each. 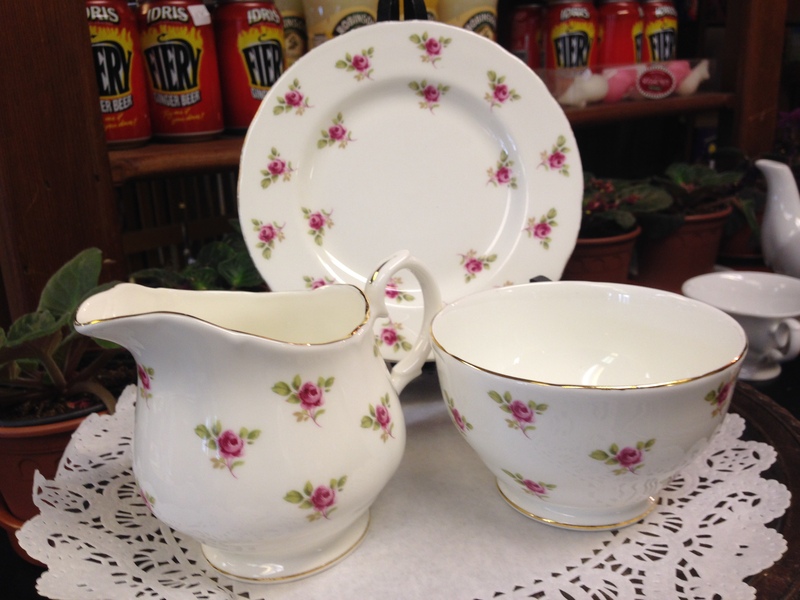 Two patterns, Dot Rose and Chintz. These pots are available for children’s tea parties, they come in a variety of shapes and characters. If you wish to serve loose tea you will need a strainer, we have a variety of shapes in silver plate or stainless steel. SILVERPLATE THREE TIER CAKE STANDS. $8.50. 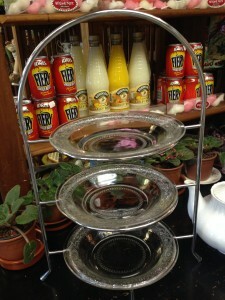 We also have various silver plate stands, wedding cake stands, single cake stands, & jelly pots. SUGAR BOWLS AND MILK PITCHERS. $4.50/pair. LINENS . Prices start at $5.50. 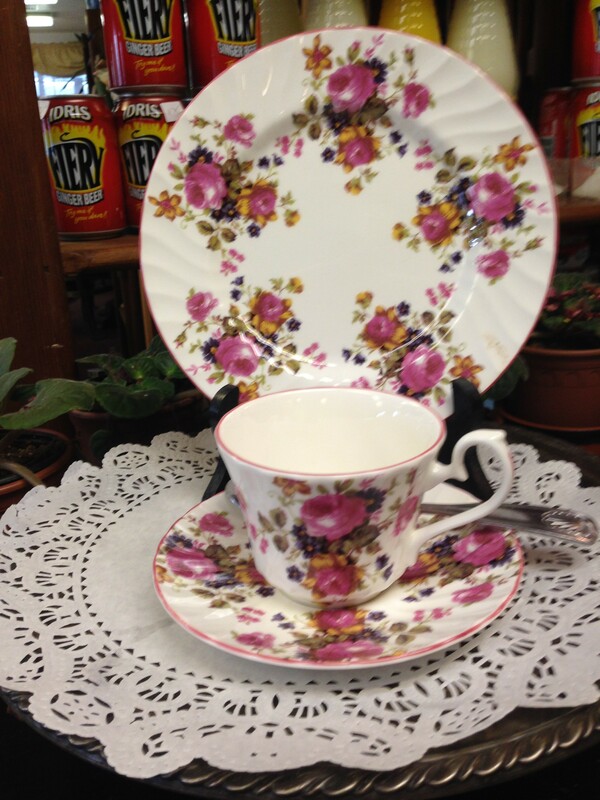 We offer a selection of rose patterned table clothes, the same as we use in our stores. We also have plain coloured table clothes in different sizes, including banquet clothes. 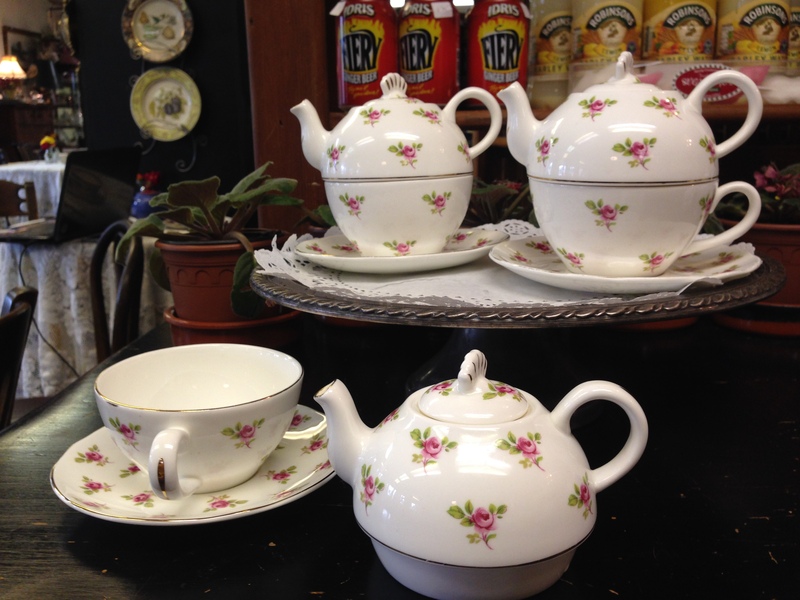 These only come in one size and are laid over the bottom clothe as we do in our stores, for that charming Victorian look, they are perfect for showers and all manner of tea parties. LACE AND COTTON APRONS. $4.50. Our aprons come in one size and fit most people. We have a variety of styles from lace to plain Victorian . If you click onto the catalogue section they are illustrated. Water glasses. $ 1.10 each. Wine glass. $ 1.25 each. Champagne glasses. $1.50 each. TEA URN – 40 CUPS $15.00 per day. 100 CUPS $15.00 per day. COFFEE URN – 40 CUPS $15.00 per day. We do not have tables, chairs and tents of our own to rent, but we work with several companies who do and we can help you figure out what you need and order it for you.